Tonight I'm going bowling. Knowing that, this manicure makes sense, no? The white is Marshmallow (Essie), the red stripes were done freehand using a striping brush and Tasmanian Devil Made Me Do It (OPI). The thumb as the bowling ball was done with Black Onyx (OPI), then three dots of Movie Star (Essence), topped with three more dots of Black Onyx. Now excuse me while I go bowl a perfect game. I like your choice of accent nail, cute! Only us nail polish addicts would think to have our mani match our bowling event! This is hysterical and awesome! This is amazing, and I have to tell you I'm gonna try this for Lebowskifest next weekend! 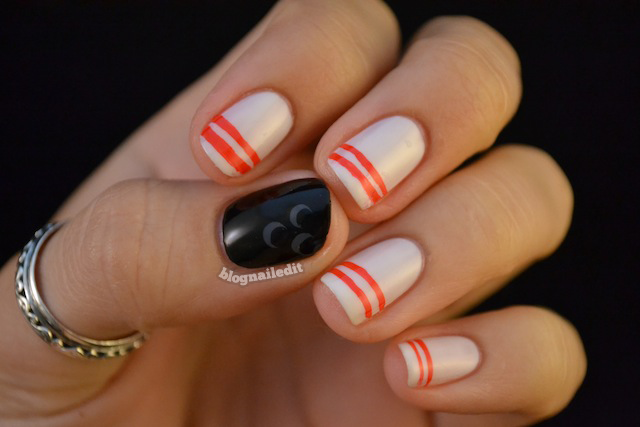 I've been trying to figure out how to incorporate bowling into a mani for it. Thank to so much for posting!!! I've seen Marshmallow several times now, and it looks like a great white-ish color. Does it go on streaky like many lighter colors tend to? I'm not sure if streaky is the right word, but it's definitely a 3 or more coater. I love it for that though. The final product is a much softer opaque than a creme finish, so be patient with it and let it build. You'll love it!